The Costa del Sol region of Southern Spain is bathed in great weather, beaches and golf courses; so, the last thing the new resort community of Real de la Quinta needed was another traditional 18-hole golf course. With time, money and land at a premium today, especially for resort courses, more golf architects are turning to less than 18-hole layouts. Radically new and different golf courses, including 6, 9 and 12-hole layouts, are becoming a popular alternative; helping attract more people to the game and appealing to existing golfers looking to play a shorter round. With over 30 courses within a short drive of the site, a lack of suitable land for a traditional course, and the desire to provide a wider variety of amenities than typically offered in the area, the DTJ design team, working with Manuel Pinero (golf designer, advisor and Spanish PGA and Ryder Cup Champion), developed an innovative plan for a non-traditional golf experience for the Real project. 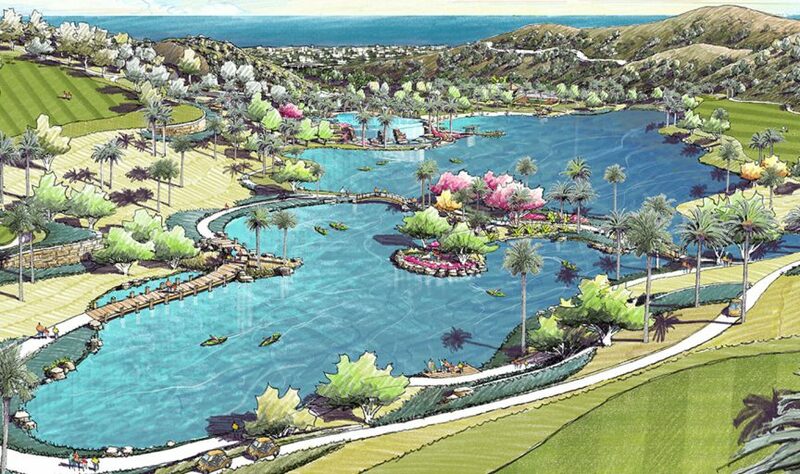 The solution was to create a golf course as part of a larger, multi-purpose resort experience, co-mingled in the heart of the project, including a large recreational/watersports lake and lake club, multi-use trail network and a 6-hole golf course and golf training academy. The design and layout of the course incorporated multiple tee and green placements to create different lengths and challenges, offering a varied course experience if played over multiple days, or as a 6-, 12- or 18-hole experience. The course was also designed to work in combination with the golf training academy, where guests could take lessons with a professional trainer, utilizing world class training and practice facilities, before testing their skills on the golf course. The steep valley topography required careful grading to create a series of terraces, allowing for different activities at different levels of the site. The strategic placement of berms, bunkers, trees and retaining walls helped create a safe experience for both golf and non-golf users of the area. When built, the REAL golf experience will be challenging enough for good golfers but still fun for amateurs and new golfers in a more relaxed environment.